I’ve said it many times, but I am really not a fan of summer fashions. Sadly, most men seem to regard summer as an opportunity to forgo all sartorial standards by donning grotty shorts and assorted dirty collarless T-shirts. Two items of summer apparel I’d single out for pent-up ire and vented spleen are sandals and flip-flops (jandals/ thongs if you’re antipodean). Both items seem to have become acceptable street wear, and now that designer labels have jumped on the band wagon they seem set to remain so. I just don’t understand the appeal of these items. For starters, next to the male member there is no less attractive part of the human anatomy than feet – even more so in the case of men. I’m not much keener on female feet, but at least, for the most part, they come without hairy toes. And unlike we men, women will often beautify their toe nails, which although not a vast improvement is nonetheless an improvement on nature. So why anybody would want to put their feet on display is beyond me. In a bid not to appear unsporting while in NZ last Christmas, when forced by my girlfriend’s family to wear flip-flops I reluctantly relented. I quickly realised that far from missing out on a new level of summer-time comfort and practicality these pieces of footwear were anything but. Not only did the bit between your toes irritate, but anything approaching a greater rate of acceleration than an old man’s shuffle and likely as not the thing would fly off your foot – gracefully arcing across the sky before decapitating some unsuspecting passer by. This was unless you curled your toes as you walked. Unpleasant aesthetic aside, sandals may be more practical but judging by some designs not that much more. Obviously I’m not advocating socks and shoes in summer, but it is possible to be comfortable without sacrificing your dignity. Fellow columnist Stephen Pulvirent recently advocated the Italian driving moc, a sound choice. However, I have relatively flat arches so prefer a little more structure. In that case I’d take a serious look at Italian loafers. London based Fin’s and Shipton & Heneage offer an eminently affordable range to a reasonable standard. In the case of Fin’s, they offer a limited edition Amalfi collection combining nubuck and linen. My own personal default setting is the boat shoe. The brands Sebago, Redwing and Timberland are excellent choices in my view, with offerings in nubuck, leather and suede to play with. Online retailer ASOS do a very affordable range. 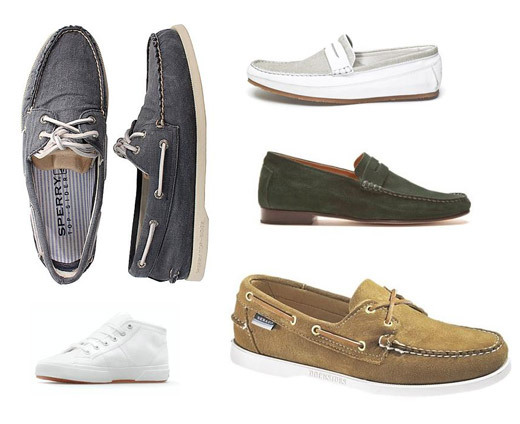 However, wishing the shoes to be as light and as aerated as possible I’m tempted to invest an offering from the daddy of all boat shoe makers, a canvass Sperry Topsiders. Versatility personified they sit as well with shorts as they do chinos and cotton jacket. Whatever the time of year, many men live in training shoes. Not normally a shoe I’d advocate, but it is possible to incorporate these into the summertime wardrobe provided you pick the right style. I’m not talking Nike Air or other over staked brightly coloured offerings but of course canvass pumps. These ought to be plain white in my view and two offerings that caught my eye are the classic Superga Cotu and Albam’s new Gourmet Tre C. Either will sit well with white jeans, easy cut linen trousers and light khakis, while being more than suitable for shorts. Andrew Williams blogs at BespokeMe and is based in London. His clothing label Bulldog & Wasp represents his philosophy that style is a frame of mind not just a state of dress. Can’t imagine vacation without them. Cary Grant wore them. Enough said. I’m sporting white canvas Sperry Topsiders in this Georgia heat. Some days I’ll switch it up with a pair of tan Clarks Mansell loafers. Psychoanalysts all over the world must have been sent into overdrive by this truly dire remark. Unexpected reference to male anatomy aside, I couldn’t agree more with this article. I’d love to be able to wear flip flops but, except within jumping distance of a beach or swimming pool, I don’t really want my feet on display. More to the point, as you say, I seem to be incapable of wearing them comfortable. If there’s one thing less attractive than a man in flip flops, it’s a man in flip flops shuffling along toes clenched, feet spattered with blood from wear the blasted things saw his feet to pieces. Boat shoes it shall be. Ive never quite understood this repulsion of feet. Then, one day, I visited the mediterranean and it made perfect sense. Not to say that mediterranean men have the worst feet, it’s just that hirsuit feet are not easy on the stomach, especially after a meal of fetta cheese, olives, sun dried tomatoes and cheap wine. Oh I can’t agree more – although I wouldn’t have made the member comparison – after all beauty is in the eye of the beholder. Show them a bit of sunshine and Englishmen throw caution (and style) aside and embrace the most extra ordinary summer clothes. Flip flops – OK; sandals – ok, but please NO socks; Thongs? No No NO! I confess I have painted my long-suffering husband’s toes from time to time hoping to up the appeal factor (metallic blue is a favourite) but to be honest most men’s feet are best socked or shod. Unless of course they have regular pedicures… which, let’s be honest, most don’t. Being a manager in a shoe store, I see the potential nightmarish fashion sense that guys seem to deem appropriate and “cool”. For a man to be chic with his footwear while instilling that sense of casual nonchalant summer effortlessness is a dangerous line to ride. The canvas shoe is becoming ever more popular again, even in the young men’s wardrobe, as it is a lazy excuse for slip on comfort. Since casual is the name of the game in summertime, cream, gray, and brown seem to be the hot colors flying off the shelf. Boring and neutral, I could never agree that this is the season to be loud and make a statement. Companies like KEDS and Converse are returning the favor by offering more designer fashions which push the envelope with a punch of color and unique designs. The casual sandal is still very much the favorite, while I shudder at the concept of “toes in leather banded” offshore designs. I am not totally against the cloth thong for men as long as it is worn properly, with linen pants, or with a nice pair of jeans. Thongs with shorts just isn’t cutting it for me, and the ensembles continue to surprise me. yes, I think part of the problem with flip-flops is when they are worn with something that runs counter to the idea of warm-weather lounging. Like when you see people wear long sleeves and heavy jeans and then are wearing a pair of flip-flops. Otherwise, i see nothing wrong with flip-flops. The best menswear around at the moment that is affordable and doesn’t leave us wearing ‘grotty shorts’ and ‘dirty collarless shirts’ has to be the simpler men’s clothing ranges on the high street like Uniqlo – clean and simple. I won’t be shopping anywhere else any time soon (and also won’t be sporting flip flops). I personally love going barefoot. If you take the time to trim your toenails, there’s nothing more pleasurable than taking a barefoot stroll down the beach. I think sandals are cool. With the right combination you could even go formal with the right classy sandals. amy wife doesn’t agree though. 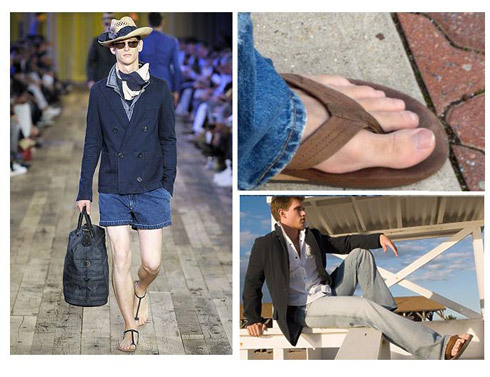 I agree in general with the ideas behind the hatred of flip-flops that all men’s style blogs seem to share. However, the past two years I have still worn them regularly, and not just at the beach. And I looked just fine. Here’s how to pull it off: live in Southern California or Southeast Asia. Personally, I lived in Southern California and spent four months in Thailand. Especially in Southeast Asia, almost everyone wears flip-flops or other sandals, because it’s torturous to your feet otherwise (not to mention it’s often quite wet besides from your own sweat). In California, the style just works. Of course, the rest of your outfit has to match. It’s quite a different look from New England (which for some reason is usually mentioned as a style with which flip-flops look bad, which is true, and California is never mentioned). In general, I dislike the SoCal style, actually. However, if you implement only certain elements into an otherwise well-conceived East Coast outfit (I’m from New York) you can look good, and the flip-flops fit just fine. By the way the undeniably best Southern California flip-flops are by Rainbow, at rainbowsandals.com. Don’t make judgments based on the ubiquitous and awful-looking alternatives. I recommend visiting Rainbow’s factory and store in San Clemente if you’re in the area and want to get some. And finally (sorry for so many comments) if they’re hurting you, you’re doing it wrong. Buy good sandals and wear them around the house for an entire weekend if you don’t want to be seen shuffling around in public. You need both to break in the sandal a little bit (it may chaff a bit at first, just as canvas or boat shoes usually do…), and to figure out how to walk in them. You don’t need to curl your toes if it’s a good flip-flop and if it fits properly. And you’ll never actually kick them off, even though it feels like you might. You just have to get used to it. Which is exactly the same as getting used to wearing “real”, nice clothing for the first time. No-one feels comfortable seriously wearing suits and so on for the first time, even if they’re well-tailored and fit properly. In Thailand I rode around on motorcycles wearing my Rainbow flip-flops. You do a lot with your feet on motorcycles, including changing gears, braking, and of course balancing yourself at stops. That should tell you how serious flip-flops can be as footwear if you’re comfortable wearing them.